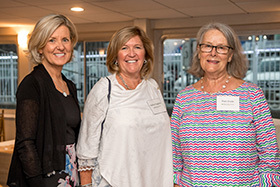 BankGloucester is making an investment in the community’s health with a $100,000 gift to support Addison Gilbert Hospital. The funds will be used for Addison Gilbert’s capital needs, including expansion of the hospital’s rehabilitation and sports medicine department and the expansion of the Senior Adult Unit (SAU), which provides acute inpatient geriatric care. 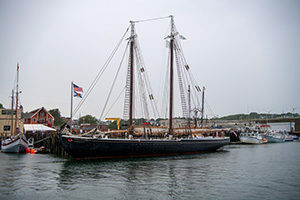 The bank was honored during the Addison Gilbert Society’s annual Gloucester Harbor cruise on July 17 and was represented by President and CEO Patrick Thorpe, Board Chair Charles Nahatis, along with other members of the Board and Executive Team. Addison Gilbert’s SAU provides interdisciplinary inpatient care to patients 65 and older who have experienced a sudden change in mental status or who are experiencing an acute phase of a chronic illness or mood disorder. These changes can cause behaviors that may place them at risk in their homes or in community-based settings. The SAU is a Nurses Improving Care for Health System Elders (NICHE) Exemplar site. NICHE is a national geriatric nursing program designed to improve care for older hospitalized adults. Addison Gilbert Hospital’s rehabilitation and sports medicine department provides acute care and outpatient physical, occupational and speech therapy services for both pediatric and adult populations. Staff provide treatment for a wide range of musculoskeletal, neurological and communication diagnoses. As part of Addison Gilbert’s capital improvement plans, the hospital will increase the department’s space, allowing for more treatment areas for patients and additional workspace for staff. 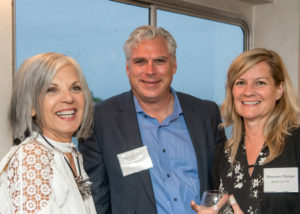 BankGloucester President and CEO Patrick Thorpe (second from right), Board Chair Charles Nahatis (far left) and other members of the bank’s board and executive team join Cynthia Cafasso Donaldson, vice president of Addison Gilbert Hospital, at the Addison Gilbert Society’s annual Gloucester Harbor cruise on July 17.